Awesome cadre of master-thief NPCs...and CLOCKWORK SIEGE CRABS! This installment of Kobold Press’ Demon Cults-series clocks in at 16 pages, 1 page front cover, 1 page editorial/ToC, 1 page advertisement, 2/3 of a page SRD, leaving us with 11 1/3 pages of content, so let’s take a look! 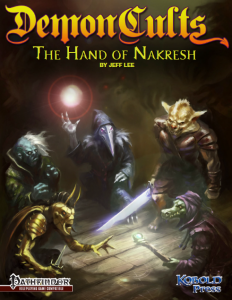 The fourth Demon Cult the series offers would be the Hand of Nakresh – who is Nakresh, you ask? He is the forty-fingered simian demon-god of thieves, with his lower left hand reserved for his most daring of thefts – it is this hand that gives this cult its name. The leadership of the cult is firmly in the hands of the Five Exalted, which receive full-blown statblocks herein – a kobold alchemist, a gnoll trapper, a derro sorceror, a tengu cleric and a roachling sanctified rogue make up this illustrious party, which could pretty much be run as an opposing adventurer party,a rival group, should you choose to. Beyond the basics, you should be aware that the members receive background stories and minor, loving tidbits – like the roachling’s mutation, which nets him 4 hands. Small special features like this and the superb equipment (yes, influences CR) set a group apart. Well done! As always, the pdf does sport a significant array of exceedingly detailed adventure hooks involving the cult, grouped by rough APLs and once again, the hooks go beyond the boring default, establishing some rather cool and inspired ideas and providing enough fodder for DMs to base multiple adventures around the cult. Midgard-aficionados will be glad to hear that we receive advice for using the cult in Midgard. There is a new spell herein, a variant of mirror image, wherein the duplicates run in random directions if you move – I do like the concept and the spell is functional, but I would have liked to see interaction with damaging terrain – do the images running over such terrain ignore it? I assume so, but this conversely makes finding the true culprit easier. The magic items sport a demoralizing aklys and a magic monkey’s paw for luck – and an artifact. This one is a beauty: The Ley-line absorber can tie in with the agendas of some members, aiming to steal magic and absorbing it for a vast power-gain of the operator – now that is a high-profile heist! “But wait”, you say – “I don’t use the Midgard-setting or ley lines!” Perhaps you are wary of the ley line magic rules or perhaps it doesn’t fit your concept. Well, the artifact comes with a second version, one for ley-line-less settings! Now *this* is care! Oh, and then there is the new vehicle provided herein. Nothing I could write would drive home the awesomeness of the concept better than the one line before the devices’ stats: CLOCKWORK SIEGE CRAB! Editing and formatting are top-notch, I didn’t notice any significant glitches. Layout adheres to a modification of Kobold Press’ beautiful 2-column full-color standard, with the borders evoking the theme of the gorgeous front cover. The pdf comes fully bookmarked for your convenience. Jeff Lee’s cabal of master thieves is awesome – whether as a rival party, as high-class thieves or as elite criminals, I really, really like this installment. The writing of the fluffy hooks retains the significant quality established in the series and the artifact is a cool plot-device. While the new spell did not wow me and while I wasn’t too excited about the solid new items (though I love the minimalistic style of the pulpy monkey’s paws! ), there is this level of detail of the characters I enjoy. We have nice little tidbits, resources worthy of such an elite force…and we have a CLOCKWORK SIEGE CRAB. Say it with me: “CLOCKWORK SIEGE CRAB.” Hell yeah! You can get this awesome cadre of foes here on OBS!